Americans have an illogical love affair with their vehicles. There are 209 million licensed drivers in the U.S. and 260 million vehicles. The U.S. has a higher number of motor vehicles per capita than every country in the world at 845 per 1,000 people. Germany has 540; Japan has 593; Britain has 525; and China has 37. The population of the United States has risen from 203 million in 1970 to 311 million today, an increase of 108 million in 42 years. Over this same time frame, the number of motor vehicles on our crumbling highways has grown by 150 million. This might explain why a country that has 4.5% of the world’s population consumes 22% of the world’s daily oil supply. This might also further explain the Iraq War, the Afghanistan occupation, the Libyan “intervention”, and the coming war with Iran. The 2008 cataclysm was created by the voracious greed and avarice of Wall Street, sustained by corrupt politicians in Washington, non-existent regulation by banking regulators, Federal Reserve easy money policies, unspoken guarantees of Fed bailouts if Wall Street excess risk taking blew up, and millions of delusional Americans with an unlimited credit line. 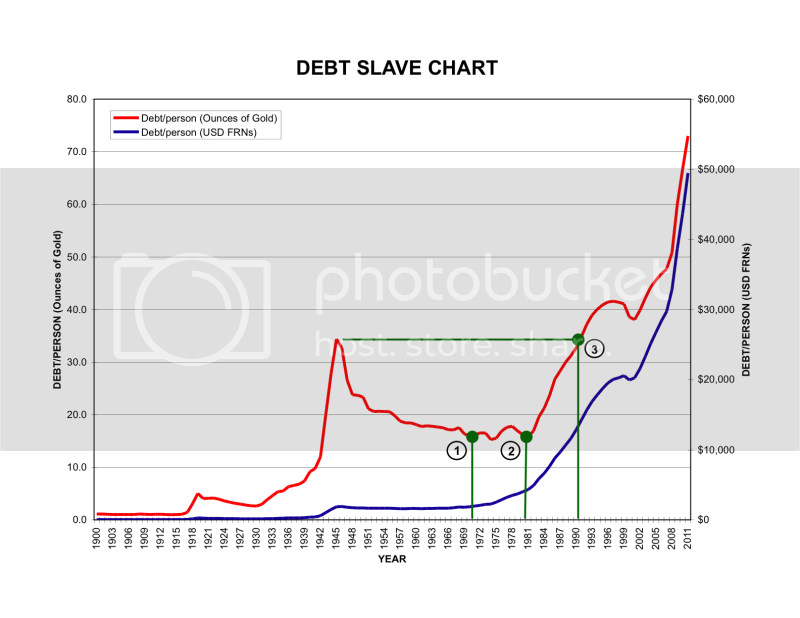 Excessive debt created the problem. Adding debt is the present solution to the problem. And the accumulation of debt will lead to a tipping point that destroys the U.S. dollar and topples the Great American Empire. This spiral of government sponsored debt financed debacles has shockingly accelerated as we have supposedly been experiencing an economic recovery for the last two years. The 2008 financial meltdown was the result of too much debt peddled to too many people who never had the means or intentions to repay the debt. The Wall Street peddlers of debt didn’t care if it got repaid because they had already packaged it, bribed Moodys and S&P to rate the toxic garbage as AAA, and sold it to their “clients”. Then they made derivatives bets that it wouldn’t be repaid and raked in billions more as their Ponzi scheme unwound. There was just one problem with their master plan. The Wall Street titans made their derivate weapons of mass destruction so complicated and confusing that their own evil organizations of Harvard MBAs didn’t understand them. Enough hubristic CEOs existed at enough financial firms (AIG, Lehman, Bear Stearns, Citicorp) to bring the entire system crashing down as the toxic derivatives intertwined every major institution in the worldwide banking cabal. What has happened since those dark days of 2008 is mind blowing in its epic proportions and epic stupidity. To quote Doug Casey, “Not only haven’t we done the right thing, we’ve done the exact opposite of the right thing.” It is absurd and ultimately suicidal to cure a debt disease by administering massive doses of more debt. But that is exactly what those in power have done. The National Debt has risen from a $9.7 trillion to $15.6 trillion, a 61% increase in three and a half years, while our real GDP has grown by $244 billion, a 1.9% increase. Not exactly a fabulous return on investment. But at least there are 7 million less people employed today than there were at the peak in 2008. Plus, senior citizens and middle class savers have seen $450 billion of annual interest income they were earning in 2008 pilfered from their savings accounts and handed to the Wall Street banking elite through Ben Bernanke’s ZIRP. The Federal Reserve has tripled their balance sheet (actually your liability) from $950 billion to $2.9 trillion. Various other Federal government controlled bureaucracies (Fannie Mae, Freddie Mac, FHA) have stealthily subsidized hundreds of billions in losses on behalf of the criminal Wall Street banks. Other Federal government run agencies (BLS, BEA, CBO) exist solely to massage, manipulate, misuse, and malign economic data and financial projections in order to muddle, misinform and mislead the American people about the true nature of our ongoing economic calamity. Propaganda and obfuscation are the scheme of choice by the powers that be. They are counting on decades of government run public education to insure that millions of non-critical thinking dullards will be unqualified or uninterested in the truth about our grim economic prospects. The oligarchy’s master plan has centered on houses, automobiles, and the illusion of a jobs recovery. Total U.S. credit market debt has RISEN from $50.9 trillion in 2007 to $54.1 trillion as of 12/31/11, a $3.2 trillion increase. Household debt has declined from $13.8 trillion in 2007 to $13.2 trillion as of 12/31/11. The mainstream media would point to this $600 billion decline as proof that Americans have embraced austerity and have learned their lesson. Of course that would be a lie. The Wall Street banks have written off $200 billion of credit card debt and the 5 million completed foreclosures extinguished another $800 billion of mortgage debt. The truth is that consumers have continued to pile up debt. Much has been made of corporate America being flush with cash. If they are so flush, why have they added $900 billion of debt since 2007, an increase of 13% to an all-time high of $7.8 trillion? The revealing data shows up in the financial company data. These Wall Street national treasures have reduced their debt from $17.1 trillion in 2008 to $13.6 trillion as of 12/31/11. How were they able to do this, while writing off $1 trillion of consumer debt? You guessed it. They dumped it on the American taxpayer. The Federal government increased their debt from $5.1 trillion to $10.5 trillion. And our old friends called government sponsored enterprises (Fannie, Freddie, Student loans) increased their debt from $2.9 trillion to $6.2 trillion. Wall Street banks and millions of deadbeats who chose to game the system and live the good life have effectively foisted their $4.5 trillion of debt upon the backs of middle class taxpayers who lived within their means. Another $4.2 trillion has been pissed down the toilet by Obama with his $800 billion Keynesian porkulus program, home buyer tax credits, cash for clunkers, green energy boondoggles, 47 million people on food stamps success story, 99 weeks of unemployment, doubling of SSDI membership, and his multiple wars of choice in the Middle East. The average hard working, taxpaying American has been enslaved in debt of such proportions that they will never be able pay it off. Your share of the $15.6 trillion National Debt is now $50,000, and growing by $4,500 per year. Your share of the future unfunded liabilities, created by the people you elected, is approximately $350,000. This crushing burden is in addition to the $13.8 trillion of mortgage, credit card, student loan, and auto loan debt Americans have accumulated in the last three decades of delusion. Forty percent of all credit card users do not pay-off their credit card every month and carry an average balance of $16,000 at an average interest rate of 15%. Good to see the Wall Street banks passing along some of their 0% borrowing windfall to their “customers”. You may have noticed the corporate mainstream media, crooked politicians and lying Wall Street shills attempting to pound the economic recovery storyline into the consciousness of a terminally distracted populace. This is part of the Bernays inspired master plan of a small cabal of powerful men to control the public mind and keep our mass consumer society functioning smoothly so these corporate fascists can continue to gorge upon the carcass of a once vital republic. Decades of mass media consumer indoctrination, dumbing down of children through public school education and the conscious manipulation of attitudes and opinions of the malleable masses has succeeded. The invisible government of the rich and powerful has effectively converted responsible citizens into mindless consumers of products, bought with debt, peddled by associates of the invisible government. The crowded shopping malls, automobile showrooms, and restaurants are a testament to the power of propaganda and the intellectual bankruptcy of a vast swath of the American population. Do you recognize any of these traits in our president (Obama), congressmen (Weiner, McCain) Wall Street bankers (Dimon, Blankfein), corporate CEOs (Immelt), and mass media titans (Murdoch)? These people and many more like them will stop at nothing to further their self-serving agenda. They are intelligent and highly skilled at lying and manipulation. They lack empathy and don’t care what others think as they relentlessly pursue riches and power no matter the damage they inflict upon the people they so casually abuse, scorn and look down on. These are the people attempting to convince you that the path to economic recovery is through increased spending by consumers, utilizing debt supplied by them. The entire recovery theme is a sham, financed by the Federal government with your tax dollars and the tax dollars of future unborn generations. I’ve arrived at this conclusion after pondering what I’ve been seeing with my own two eyes and through the insightful analysis found in the non-mainstream media (Zero Hedge, Jesse, Mish and many others). The mantra being pounded relentlessly by the mainstream media is that retail sales are booming and the unemployment rate has declined significantly, therefore an economic recovery is at hand. 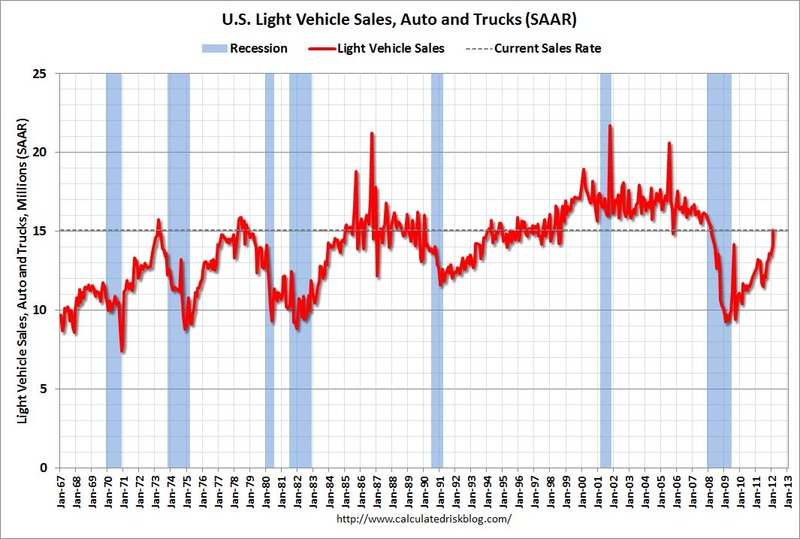 The chart below reveals the dramatic surge in vehicle “sales”. The annual pace is all the way back to 15 million, from the low below 10 million in 2009. The brief surge in mid-2009 was due to Obama’s highly successful Cash for Clunkers program that cost taxpayers $2.8 billion or $24,000 per car sold. It was highly successful for Government Motors (GM) and their union workers (Obama voters). This rapid surge in auto sales has also resulted in a boost to overall retail sales, which have reached an all-time high. Automobile “sales” make up 18% of the retail sales number, by far the largest segment. The “record” retail sales are the result of surging gasoline sales, swelling food inflation, and a somewhat confusing cascade of car sales. It’s somewhat confusing until you realize how and why the 50% rise in vehicle sales has been accomplished by our Bernaysian masters. Retail sales in the first two months of 2012 are up 8.2%, led by a 9.2% wave of motor vehicle sales. Auto sales are at levels last seen in early 2008. This seems peculiar, since there are still 7 million less employed people in the country than in early 2008 and the real median household income is 9% lower than it was in early 2008. Real average hourly earnings have fallen for the last three months and are 1.2% lower than they were in October, 2010. A critical thinking person might ask himself, how could American households with less jobs and lower wages increase their purchases of automobiles by 50% in the last two years? GMAC, after contributing mightily to the financial crash of 2008 through their reckless subprime mortgage (Ditech) and auto lending and requiring a $16 billion bailout from American taxpayers, changed its name to Ally Financial in 2009. It’s sort of like John Dillinger using acid to try and change his fingerprints. Ally Financial provides financing for all GM and Chrysler customers and dealers and is the market share leader in auto lending. Ally Financial still owes the American taxpayers $12 billion. Ally Financial is a ward of the Federal government and will do anything it is told to do by Obama. The recent foreclosure fraud settlement required Ally to pay $250 million to the customers it defrauded. They will only pay $110 million based on their inability to pay $250 million. Sounds like a company that should be increasing their subprime loan portfolio. Obama and his minions instead received a commitment from a lender they own and control to cut principal for delinquent borrowers and refinance underwater borrowers. And Obama didn’t even offer us a cigarette afterwards. “When you get to junior liens and HELOCs you will understand why I have been saying that Ally Financial and BAC need to be restructured. With a plus 20% loss rate on second liens, Ally has substantial capital issues to put it mildly. But look at C right behind them with a loss rate in the mid-teens followed by BAC. Yikes. This type of loss rate is typical for credit cards and both of these second lien portfolios are > $100 billion. And the real lesson, dead friends, is that the good old USA is a subprime nation, a society of individuals whose aggregate probability of default is probably around a “B” to “CCC.” Convert the loss rates in the stress tests to bond ratings using the break points from Moody’s or S&P and tell me what you see. When you understand this background, anecdotal evidence that seems absurd starts to make sense. I spend two hours per day on the road and have plenty of time to observe my surroundings. I drive through the Mantua section of West Philadelphia every day. The average household income in this neighborhood is $16,000. The average home value is $25,000. The true unemployment rate exceeds 40%. At least 20% of the properties are vacant and the neighborhood resembles Baghdad. Last week, I counted six brand new vehicles with registration tags in their back windows in a one block radius of this neighborhood. Every block has newer model Ford Expeditions, GMC Sierras, BMWs, Acuras, Cadillacs, and Mercedes sprinkled among the squalor. Someone is loaning these people the money to buy these $40,000 vehicles or approving them for leases. This neighborhood puts the SUB in subprime. No financial firm worth spit would make a six year $35,000 auto loan to someone in this neighborhood unless they were instructed to do so by the Federal government or were guaranteed that the future loss would be borne by someone else – YOU. Most of the ads don’t even list the prices of the vehicles. They either tout the 72 month 0% financing or they list the monthly lease cost. It seems that virtually any vehicle can be leased for $300 per month or less these days. This might explain why 25% of all vehicles are leased today. In reality, 25% of the cars being “sold” today are really just being rented for three years. Both the lessors and lessees are basing these transactions upon delusions and assumptions which will likely blow up in their faces and again cost – YOU. An auto lease payment is based upon interest rates, the cost of the car, subsidies from the auto makers, and the expected residual value of the vehicle at the end of the three year lease. When have financial companies ever miscalculated any of these assumptions? How about 2001-2002 and 2008-2009? The reason auto leases are ridiculously low is because Ben Bernanke’s zero interest rate policy is providing free money to Ally Financial and the rest of the Wall Street zombie banks and creating huge mal-investment – Again. The auto makers see no risks, as the used car market has been extremely strong for the last year and they anticipate continued strong demand for cars as they come off their three year leases. Therefore, they have estimated the residual values three years out at a very high level. The strong used car market may have been slightly impacted by the destruction of 700,000 vehicles under Obama’s Cash for Clunkers debacle. The combination of excessively low interest rates and excessively high residual value estimates leads to ridiculously low lease rates. The sales statistics for the first two months of 2012 reveal why this will blow up in the faces of lessors and the predictably incompetent financial drug dealers. It seems the delusional American public and their love affair with big SUVs, pickups, and their 8 cylinder luxury wheels will continue until they are hit over the head with the baseball bat of $5 a gallon gas. The Madison Avenue Bernays disciples have molded the minds and formed the opinions of millions of easily influenced, financially ignorant superficial Americans into believing the vehicle they drive is a true measurement of success. These people choose being up to their eyeballs in auto debt or perennial renters of luxury vehicles to appear prosperous to their neighbors and coworkers rather than actually achieving real success through the time honored tradition of earning more than you spend and saving the difference. The fact is that 80% of all the vehicles being sold in the U.S. are SUVs, pickups, crossovers, minivans, and larger cars that get 25 mpg or less. As gas prices continue to rise towards $5 per gallon, a war with Iran looming in the near future, interest rates beginning to rise, and the country headed back into recession (MSM is wrong about the recovery), the car makers are poised to again experience enormous losses. Auto makers will have a sense of déjà vu as they have committed an epic blunder by overestimating the future value of the gas guzzlers they have been leasing. As a result, when the leases expire and auto makers take back the SUVs and pickups that get 15 mpg and attempt to resell them, the losses will run into the billions of dollars. There will be no one buying used gas guzzlers, with gas costing $5 per gallon. As the millions of subprime borrowers realize they can’t afford car payments, paying 40% more for gas, and trying to put food on the table, auto loan delinquencies will soar. This is as predictable as the housing market collapse in 2005. None of this matters to the psychotic governing elite who only care about the illusion of recovery today. These vampire squids will not be satisfied until every drop of blood is sucked out of the national carcass. Ally Financial is part of the Federal Government and is being used to promote the agenda of the governing elite. They join Fannie Mae, Freddie Mac, and the Federal student loan peddlers as the primary tools of the corporate fascist powers that control this country. The nominal private ownership of these companies is a sham, as the state dictates how they will be run and who they will benefit. This corporate fascist empire is built upon an unholy alliance between big banks, big business, big media and big government, with each protecting and enriching each other. The psychopaths who are drawn to these organizations want to control people. They desire power, wealth, and the ability to manipulate public opinion. Their tactics include spreading fear and an atmosphere of paranoia in order to convince the populace that more government action will improve their lives. We are headed towards economic and financial collapse as these psychopaths will never willingly reverse course and the majority of our population has become so degraded (have you been to a Wal-Mart lately) that they are incapable or unwilling to confront the psychopaths. The next time you hear a government drone, Wall Street shyster, or corporate mainstream media whore declare we are experiencing an economic recovery try not to laugh out loud. Their agenda doesn’t include making your life better. Prepare accordingly.